Founded in 1976, by a group of keen rifle and pistols shooters, the Aberdeen Full Bore Gun Club originally shot rifle over the old war-time RAF range at Brimmond Hill, near Dyce, until it was closed as a result of communication equipment being erected at the top of Brimmond Hill for the Oil Industry. Full bore pistol was then shot on the 30 metre range at Gordon Barracks at the Bridge of Don and .22 pistoleers used the 25 metre indoor range at the Barracks. Club Membership in the early years rose to around 120 in the early 1980's. The Club met regularly on Tuesday and Thursday evenings and on Saturday (Practical Pistol) and Sunday. When the Military closed the 30 metre range at the Barracks, the club moved its activities to the Black Dog Military Ranges, just north of Aberdeen, where the 25m 'C' range was used for pistol shooting three or four times a week, with monthly rifle shoots on 'A' and 'B' ranges. 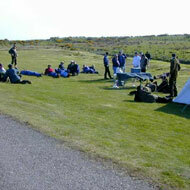 In 1995 the Club, after several unsuccessful attempts to obtain planning permission for its own facilities at a number of locations, constructed it own ranges at its current location north of Aberdeen, to which members have seven days a week access for various shooting disciplines. We support all current section 1 firearms, with our members participating in all forms of small and full bore rifle and muzzle-loading pistol and rifle shooting. We are currently affiliated to NRA, MLAGB, STS and Aberdeenshire Sports Council. We have two outdoor ranges suitable for small bore rifles, pistol-calibre (gallery) rifles, Fullbore rifles, muzzle-loading rifles and pistols. One range is 50M and operates ten turning targets. The other range is a 100M range with a 100M Covered Firing Point which includes benches for elevated prone shooting as well as benches for benchrest disciplines. On site is a clubhouse which boasts electricity, running water (when the pipes aren't frozen solid!) and male & female toilets. 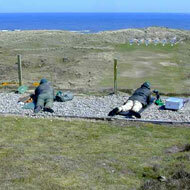 Monthly shoots take place at the 100M range for Fullbore rifle. We support, via Club Championships, Club Challenges and Open Competitions, a wide range of disciplines ranging from precision, gallery rifle & sporting rifle, small and full-bore action rifle through to 'F'-class, benchrest etc-basically we try our hand at anything and everything! In addition, many of our members compete in local, regional and national competitions including team entries to the Phoenix Meeting at Bisley. In addition to our Home range we make use of Black Dog MOD range 8/9 times a year to give our members longer range shooting up to 600M for Fullbore rifles. Once a month, we hire Denwood range for smallbore and air pistol/rifle disciplines. We also have access to a 100M range about 25 miles north of Aberdeen which is used for Fullbore and Target Shotgun shooting. Current Fees (2018/19) - no additional range fees are payable.